The Safe Place is where children go to change their inner state from upset to composed. The skills you will teach in the Safe Place are essential for your child’s development of self-regulation. Shubert uses a beanbag, but you can also use a comfy chair, throw rug, or pillow to serve as a base for your Safe Place. 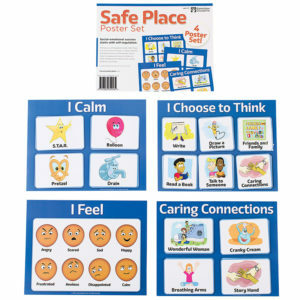 Fill the Safe Place with tools and activities that lead children through the active calming process, like the I Choose Self-Control Board and the Safe Place Poster Set. By school-age, your child is also ready to use the Feeling Buddies in the Safe Place. (See Feeling Buddies Self-Regulation Toolkit.) If you are just starting out, the breathing icons in the Free Resource Toolkit are essential for the Safe Place at any age. The first Safe Place is in the parents’ arms as parent and child co-regulate through deep breathing. As they mature, children begin to develop their own self-regulation skills with lots of encouragement, coaching, and practice in the Safe Place. By elementary school, children are starting to make the self-regulation process their own by internalizing the skills you are teaching. Elementary-age children are capable of conducting the active calming techniques independently, but you will still want to offer plenty of aid and encouragement. The most essential phrase for the Safe Place is, “You’re safe. Breathe with me. You can handle this.” Helpful phrases for guiding children to the Safe Place include, “Your body is telling me you’re having a tough time right now. Let’s go to the Safe Place together to calm down.” “You seem sad. Maybe the Safe Place would help?” “Your face is going like this (mimic the expression on his face). You seem anxious. I wonder what we have in the Safe Place that would help.” As with any interaction, your intention will largely determine how children receive your message. If you say, “You seem angry. Let’s GO to the Safe Place together,” in a tone that is frustrated, exasperated or seeks to make the child comply, the child is likely to feel threatened and shut down or lash out. If you say the exact same words, “You seem angry. Let’s go to the Safe Place together,” in a voice that sees the child as capable and carries the intent of helping him learn to self-regulate, the child will be more likely to go to the Safe Place to learn to manage his feelings in healthy ways.